University? Dean of Scientific Research? Institution? Research Center? Research Management & Tracking System (RMTS) is a comprehensive solution that serves enterprises and associations that support and supervise scientific research and development such as university Deans of Scientific Research, associations for scientific research, or scientific research support organizations. 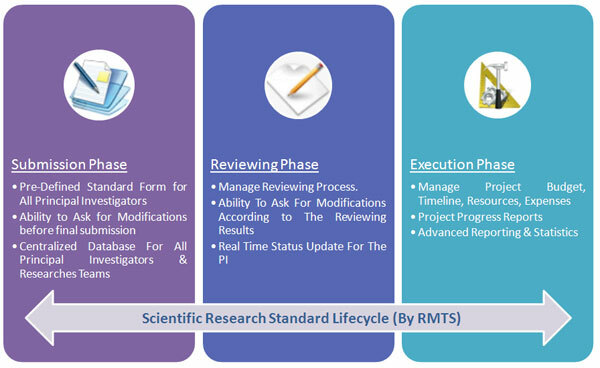 RMTS helps organize and manage the scientific research process according to its standard life cycle, as well as facilitates the communication processes between affected stakeholders such as investigators, reviewers, and research teams. RMTS can be deployed inside an enterprise intranet or via the internet, allowing widespread use of the data regardless of time and place. Unification and standardization of scientific research format.